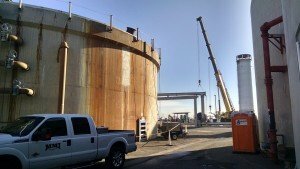 At MMI Tank and Industrial Services, we can help with a lot of your industrial construction, retrofetting, removal and plant relocation projects. Do you have Water or Wastewater Tanks that need some attention? We build and retrofit storage, cooling, waste, and pressurized tanks. We can also help you with your conveyance systems, as well as your silos, hoppers, and bins. If you have an industrial facility, a farm or anything else with large important equipment, MMI can help you fabricate new pieces, repair older pieces and even relocate pieces if you’re moving to a new location. What can we help you with? Click the link below that best describes your needs.